(CNN) -- Trains and text messages made a deadly combination when two locomotives collided head-on last year near Los Angeles, California, witnesses told an investigative panel this week. 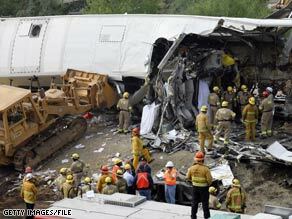 Firefighters and investigators inspect the wreckage a day after a train collision in California killed 25 people. Metrolink commuter train engineer Robert Sanchez missed a stop signal while trading text messages with a friend on September 12, leading to a collision with a Union Pacific freight train that killed Sanchez and 24 other people in Chatsworth, California. The accident injured 101 people and caused $10.6 million in damages, according to a report by federal investigators. One National Transportation Safety Board member worries other disasters loom on the nation's rail system. "One train, one day, one crew. It raises questions for me as to what the heck else is going on out there," said Kitty Higgins, chairwoman of a two-day NTSB hearing in Washington on the accident. Phone records show Sanchez was not only texting a friend just 22 seconds before the collision, but he also had made plans to allow the same friend to actually operate the train. [Sanchez to friend]: "I'm REALLY looking forward to getting you in the cab and showing you how to run a locomotive." [Friend to Sanchez]: "OMG dude me too. Running a locomotive. Having all of that in the palms of my hands." [Sanchez to friend]: "I'm gonna do all the radio talkin'...ur gonna run the locomotive & I'm gonna tell u how to do it. " At the hearing, officials said Sanchez had been caught with a cell phone twice before. Once another employee turned him in, another time a manager called his phone to see if it was with him in the train cab. "The engineer's cell phone rang. It was in his briefcase on the other side of the train. I told the engineer that he was in violation of our policy," Rick Dahl, who was a safety manager with Metrolink at the time of the accident, told the NTSB investigative panel. Federal regulations do not cover cell phone use by train crews. Records also indicate Sanchez previously had allowed unauthorized people to ride in the cab, and one person even sat at the controls while the train was operating, investigators said. Phone company records indicate the Union Pacific freight train conductor, who was not named and who survived, also sent a text message about two minutes before the collision, but no other crew member sent or received any messages while on duty, investigators said. That train crew followed all signals and other procedures properly, according to an NTSB timeline. The Metrolink train stopped at a station for 57 seconds to allow passengers to exit and board the train, according to an animation of the timeline presented at the hearing. "The engineer is required to call all signals and indications via radio," Dahl testified. Sanchez did not call any of the last three signals before the crash, investigators determined. The freight train was supposed to move onto a siding to allow the Metrolink train to pass, but it never got there because the commuter train ignored a stop signal and intercepted it at a curve. The freight train was just emerging from a tunnel in the rugged Topanga Canyon, and the trains were visible to each other in the curve for only about five seconds, according to the report. At the time of impact, the Metrolink train was traveling about 42 mph and the Union Pacific train 41 mph. The freight train braked for two seconds before impact; the commuter train didn't brake at all, according to onboard data recorders. Investigators found no problems with the signals, the trains' brakes and radios or the tracks. The Union Pacific conductor's blood and urine tested positive for marijuana, but no other crew member's from either train did. A final report on the Southern California crash is months away. A month after the crash, former President Bush signed into law a bill requiring the railroad industry to implement by 2016 a rail-traffic control system akin to the familiar air-traffic control system in the nation's airports. Such a system had been on the NTSB's "wish list" since 1990, an agency press release said. "Many lives will be saved as a result of this legislation," NTSB Chairman Mark V. Rosenker said at the time. CNN's Ted Rowlands and Jim Kavanagh contributed to this report.